The purpose of this research report was to conduct a detailed review of the standards used and practices followed at various airports concerning the fuel hydrant ESD systems, as well as any legislative standards that may apply. An additional requirement was to identify any further work that may be necessary concerning the various protection layers that mitigate the scale of a spillage and their effectiveness. 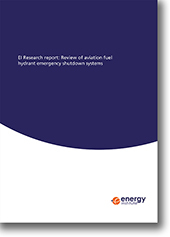 This study was commissioned to provide a detailed review of aviation fuel hydrant emergency shutdown systems, in recognition that there exists considerable variation in their design and in the equipment used. It was produced to assist all those involved in the design, construction, operation, inspection and maintenance of aviation fuel hydrant emergency shutdown systems and all companies involved in the fuelling of commercial aircraft with jet fuel.